Another of those fatuous fantasies about lords pretending to be servants, as wealthy Anna Neagle falls for footman Michael Wilding. Even though Herbert Wilcox's direction tends to be heavy-handed, there are many deft touches, mainly supplied by Nicholas Phipps's light-as-air screenplay. 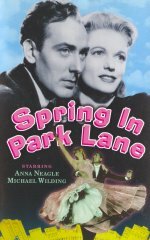 The two leads carry off the plot with some aplomb, and Wilding is especially effective, playing his role of charming wimp surprisingly well. Not to everyone's taste these days, but a big hit in postwar Britain.